Not only did McGee record from 1929 to 1934 with such artists as Amédé Ardoin, Sady Courville, Wade Fruge, and Angelas Le Jeunne, but he also later recorded two “studio” albums in 1972 and 1977 with Sady Courville for Morning Star and Swallow, respectively. Every recording mentioned above was done either with a second fiddler and with McGee providing the vocals, or in the role of the accompanying fiddler behind an accordion player and vocalist. 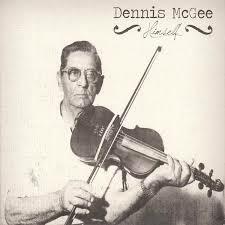 This new CD, Dennis McGee – Himself, presents McGee in the role of solo fiddler, playing mostly previously unheard instrumentals without the company of a second fiddler or an accordion player. It is a revelation on par with “junking” a stack of unknown & unissued test recordings by one of the most majestic and unique fiddlers ever to draw a bow. Since McGee was one of the earliest Cajun artists to record commercially, most musicians, collectors, and scholars regard him, along with the black accordion player, Amédé Ardoin, as the source of most traditional Cajun tunes and the techniques developed to play them; the true vine, as it were. What has been lacking, up until the release of this material recorded in 1975 by Gérard Dôle, were recordings of McGee performing unaccompanied and, perhaps more importantly, performing the more archaic and obscure types of Cajun fiddle tunes that were popular in the 19th century. D’Jalma Garnier and Mitch Reed play a medley, the 2nd tune of which Dennis McGee called “Jump Jim Crow.” Now that’s southern fiddling!